When the time comes to have a new boiler installed in your commercial building, the installation service provider you choose will have a huge impact on the overall performance of the new unit. This is because there are many ways that a new boiler installation can go wrong, and if a subpar installation service provider is selected to do the job, there’s a much higher risk of premature failure down the line. We know this because Front Range HVAC has been installing commercial boilers in the state of Colorado for over 20 years. We’ve been brought in to correct the mistakes made by other installers, and we’ve learned what best practices to employ to ensure that the overall project is a raving success. At Front Range HVAC, we know that commercial boiler installation projects are a significant expense for our customers, both in time and in money. We also know that with every new commercial boiler installation project we take on, we’re putting our reputation on the line. That’s why we take extra care to ensure that we put the safety and satisfaction of our customers first; everything else takes a back seat. Step 1: Prepare the work area for the new boiler. This step might involve the removal of the old boiler and preparations of the connecting water service pipes, electrical wiring, and mounting equipment. Step 2: Safely transport the new boiler to the installation area to confirm connectivity and code compliance (if applicable). No two commercial boiler installations are the same, so we take a customized, solutions-based approach to each one. Step 3: Install, test, and commission the new commercial boiler. This is the most time-consuming step in the process, and it’s where our expertise as commercial boiler installers shines. By employing this rigorous, 3-step methodology with all of our commercial boiler installations, we do more than drop in a new boiler, collect the payment, and then forget about it. We’re here for the long haul, remaining available for your post-installation to answer any questions or to address any concerns. We believe the biggest reason Front Range HVAC has grown to become Colorado’s premier commercial boiler installer is our commitment to service excellence. Nowhere else is this more apparent than in the commercial boiler projects we complete for our customers. 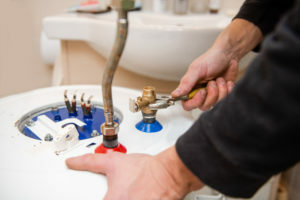 If it’s time for a new boiler to be installed in your commercial building, trust the professionals at Front Range HVAC. To learn more, call us at (303) 942-1372.